Ryan’s admirers say it’s unfair to suggest he’s merely a green eyeshade Republican. 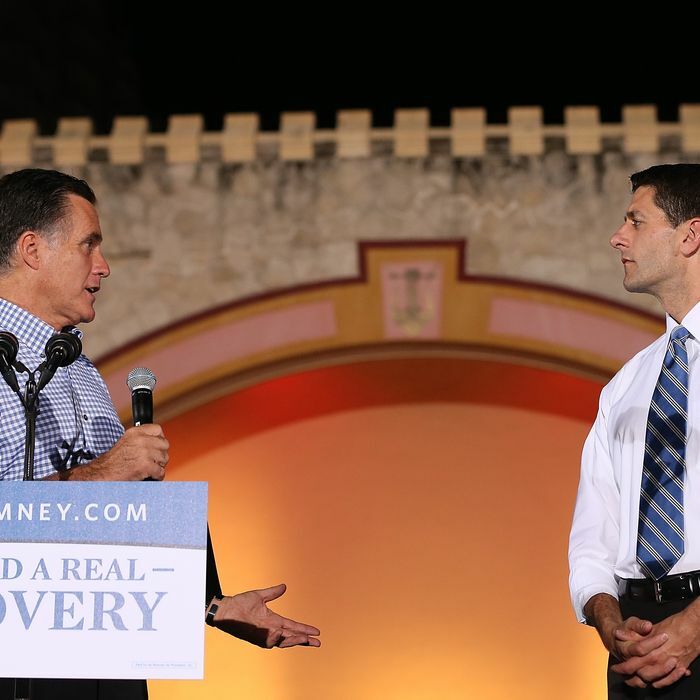 After all, his political mentor was supply-sider and congenital optimist Jack Kemp, and when Ryan bumped up against Romney’s high command during the campaign it was over the congressman’s desire to speak more to poor voters about how conservative policies could affect their lives. Before Ronald Reagan, the Republican party used to be dedicated mainly to controlling deficits. The supply-siders transformed the party’s agenda into one focused monomaniacally on cutting tax rates, especially at the top. “Green eyeshade Republican” is a term of abuse applied by supply-siders against Republicans who believe that there needs to be some connection between how much the government spends and how much it takes in. As I explained in my profile of him last year, Ryan rose through the party ranks as a fervent supply-sider. He began as a fervent disciple of Kemp, who was a fanatical believer in the economic power of marginal tax cuts, to such an extent that he believed the stronger economic growth these tax cuts would unleash could create enough revenue to provide more funding for social programs. Since the Obama era, Ryan has managed the difficult task of remaining true to his supply-side roots while also positioning himself and his party as advocates of smaller deficits. Some of this repositioning involved genuine policy changes. Unlike Kemp and Bush, Ryan has advocated massive cuts in Medicaid, children’s health insurance, food stamps, and other programs targeting the poorest and sickest Americans. He has tried to coat this policy mix with an optimistic sheen, arguing that cutting off these benefits will prod the poor to stop being lazy and dependent and launch them on a trajectory of upward mobility. So now Ryan has to, essentially, un-re-brand himself. His supporters plead that he is not “merely” a green eyeshade Republican. Stripped of the euphemism, they’re saying, Paul Ryan isn’t merely an advocate of fiscal responsibility, he is also … the exact opposite of one.